Welcome to this gorgeous condo suite at Canmore Crossing. This beautiful place is surrounded by spectacular rocky mountain views. Situated in the heart of Canmore, the condo complex is nearby all the services of downtown, with immediate access to the elaborate walking, running and biking trails. This spacious 3 bedroom, southeast facing condo is an open floor plan of 1,270 sq ft with super mountain views. Two master bedrooms are equipped with king beds, one with a full ensuite and the other boasts ensuite privilege. The third bedroom has a queen bed. There is an in-suite laundry/storage, in-floor tile heating through the kitchen & both bathrooms. Fireplace, Hickory cabinets, upgraded appliances plus a large eating bar will provide you a perfect place to enjoy a small group of friends and families relaxing get-away. The condominium complex provides secure access to elevators, gym rooms, two rooftop hot tubs and one indoor hot tub. There are two heated underground parking stalls plus additional storage for bikes and skis. You will be provided a complete guide book that contains information such as suite features, complex amenities, town services, and Canmore attractions, etc. Please note that this is a non-smoking and pet-free environment. Access codes will be provided to you a few days prior to your arrival. We are looking forward to hosting you in this beautiful mountain escape, please contact us at rockiesgetaway@gmail.com if you have any further questions. Please also visit our other vacation properties at vrbo.com/699790 and vrbo.com/722250. *Minimum stay of 2 nights and must be at least 25 years of age for rental. The condominium complex provides secure access to three gym rooms. was 10 minutes walk and great Rec centre only 5 minute walk. Well stocked kitchen and generous kitchen island for 4 and dining table for 6 so lots of space. We had a very enjoyable stay in Canmore. 2 nights was not enough! The property is well located, and well suited for a family stay. All amenities are close by; and the condo is well equipped. I would recommend this property to anyone looking to spend time in the mountains in self-sufficient accommodation. Great condo for our family. Clean , washer and dryer in unit. Location was good in Canmore. We could walk to town for lunch and dinner. Banff, 20 minutes away. 8 of us stayed comfortably in this condo. The location was perfect for walking to downtown Canmore, and driving to Banff National Park. It was so convenient to have a grocery store and liquor store in the same parking lot. We were able to cook a nice dinner in the kitchen, which was adequately furnished. Our only complaint would be that the pull-out couch mattress sinks in toward the middle, so it isn't the most comfortable sleeping arrangement. The actual beds were very comfortable. Note: one of the bathrooms is in a master suite and doesn't have its own door, so if you're renting the condo with a group of friends, be prepared to ask people to leave the bedroom while you use the bathroom. Overall we really loved staying here, and would absolutely stay here again! Great place for family reunion! As one of two VRBO suites we rented in the same building in Canmore, our family was very pleased with this large suite. It was very clean and well stocked with everything we needed to enjoy our time in the Canmore area. The location is great - walking distance to restaurants, galleries and shopping. The owner was very responsive when we had to get in touch. Thanks Sylvia! My family stayed here while enjoying several activities such as the Via Ferrata and also Rafting and hiking. 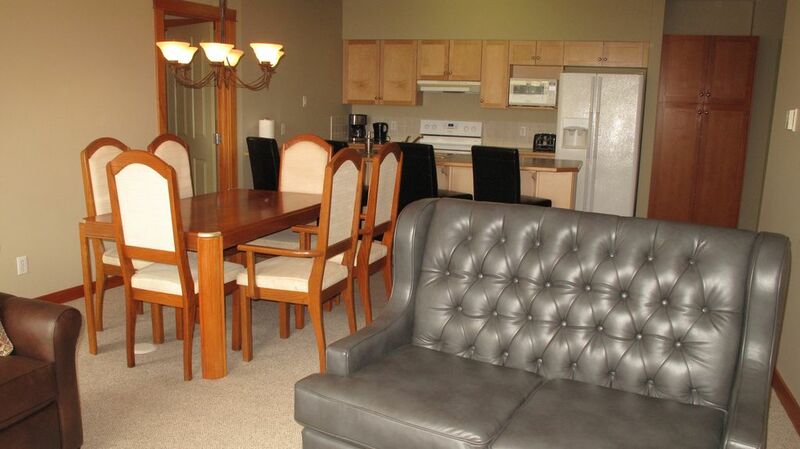 The condo was in a great location, the underground parking was handy, just an elevator ride away from the condo. It was very clean and well organized, we appreciated the labels. Would definitely recommend!! Rates are subject to change until reservation is confirmed. Nightly rates are based on 6 guests, add $20.00 per night, per additional guest.